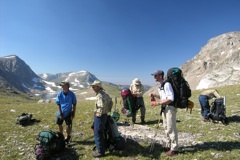 Backpacking into the Wind River Mountains has been a mainstay of our program over the years. These need not be grueling tests of survival. Good physical condition and health is imperative, however. Prospective expedition guests should have no recurrent knee, back, or heart problems and have a firm desire to “do it the hard way” and put out some honest physical work. The fly fishing we reach is phenomenal. We work at keeping pack weight to forty-five pounds or less for a week trip. Food weight is obviously kept to a minimum, so guests can expect to eat freeze dried meals or pasta and rice based dishes. 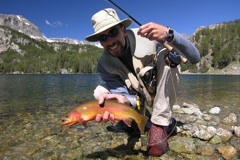 We can either do continuous moving trips, or plan a trip where we have several basecamps with lots of fly fishing possibilities. Download our equipment list for backpacking trips in pdf.